In 1492 Christopher Columbus sailed across the Atlantic and landed in the Caribbean becoming one of the first Europeans to set foot in the Americas. This land would soon be called the “New World” by explorers and colonists, but for the indigenous peoples who had been living there for thousands of years this land was hardly new. For many people the history of the Americas, including North America, begins with the voyage of Christopher Columbus, However the time since that famous voyage is only a fraction of the rich history of the continent. People had been living in the Americas for at least 10,000 years before Columbus was even born, and probably even longer. In those millennia, the first peoples of the Americas developed rich and diverse cultures far more advanced and complex than most realize. Large cities, advanced architecture, and agriculture supported massive populations. As many as 50 million people may have lived in North America before the first European explorers arrived. Unfortunately, these explorers unknowingly brought with them a deadly and invisible weapon—disease. By the time the first permanent European colonies were established, these diseases had spread through the continent and up to 90% of the native population had perished. The common stereotypes of Native American life were established by European settlers who came in contact with these scattered fragments of the civilizations that had existed beforehand. In order to better understand the history of New Hampshire, specifically the Piscataqua River watershed, as well as the lives and struggles of indigenous groups, it is important to understand their history by separating it from colonial views. New Hampshire’s landscape was drastically different 20,000 years ago than it is today. Glaciers and ice sheets covered much of Canada and the northern United States, making the area largely uninhabitable. By around 14,000 years ago the ice sheets had begun to retreat and different species of plants and animals inhabited the now exposed terrain of New Hampshire. About 12,000 years ago the first humans moved into this area and discovered a thriving ecosystem with abundant food, water and animals. These first peoples, the Paleoindians, lived in small groups as nomadic hunter gatherers. They would migrate throughout the northeast in search of food. Their primary source of food was caribou, which migrated across the state in large herds. They hunted with spears and atlatls (spear throwers) topped with razor sharp stone points. The stone tools are for the most part all that remains from this time period for archaeologists to find since organic materials like wood and bone have long since decayed. The Paleoindian phase of occupation lasted until around 9,000 years BP (before present). The next phase of occupation, the Archaic period, lasted from the end of the Paleoindian phase until around 3000 years BP. During that time the climate in New Hampshire warmed slightly and the people living there were able to exploit the abundant plant and animal life moving into the area. Deer was a staple, as were beavers, turkeys, fish and shellfish. This time period is marked by a great diversity in the types and styles of tools which were created for capturing and gathering food. People moved around with the seasons to gather different food sources throughout the year and lived in different seasonal camps, which gave rise to rich cultural and ceremonial behavior. During this time period, many local groups began to shift to more settled and less nomadic lifestyle. 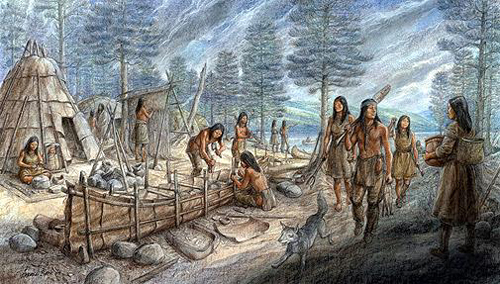 The final pre-European phase was the Woodland period and lasted until European settlers arrived in the new world. This period included the discovery of two very important technologies, pottery and agriculture. Agriculture provided a more stable food supply which allowed the population to expand. Pottery allowed people to store food and water for extended periods of time, but because it was heavy and difficult to move it required a more sedentary lifestyle. Woodland period villages were much larger than those of earlier periods and consisted of permanent and semi-permanent structures. These villages were often surround by fields for farming and “suburbs” located strategically to exploit specific resources, like fishing grounds. After the arrival of settlers this way of life was permanently changed. Ravaged by disease, groups were forced to abandon some of their larger settlements. Some Native American groups traded with European settlers for goods such as guns, metal tools, and horses. They also traded pelts to the Europeans and introduced them to crops like tobacco and corn. In time, however, the settlers spread out through the area taking over the best farmlands and hunting grounds. Eventually, as the colonies that would eventually become the United States expanded and grew, Indigenous peoples were forced to move further West and live on reservations, or assimilate into the “American” way of life. In order to fully understand the history of this region and the United States, it is important to examine history not only through the eyes of the settlers and the government, but through oppressed and marginalized Indigenous populations. Starbuck, David R. The Archeology of New Hampshire: Exploring 10,000 Years in the Granite State, 19-91, Durham, NH: University of New Hampshire Press, 2006. Mulholland, Mitchell T., and Kit Curran. “Timeline from Ice Ages to European Arrival in New England.” Nh.gov. https://www.nh.gov/nhdhr/programs/documents/timeline_new_england.pdf.